Comfortable weekend dressing at its very best – jeans, a jumper, DMs and a biker jacket. These new pieces are some of the best quality basics I own – on the whole I far prefer splashing out on basic / go-with-everything pieces than on more statement-making things, because I know I’ll get far more wear out of a cashmere jumper and quality pair of jeans than I would out of a fancy dress or something that fulfils a temporary lust for a more transient trend. Both the jeans and the jumper are from 7 For All Mankind, who I talked about in my last post (there’s also a 7FAM giveaway there, if you missed it) – both are around the £200 mark, which for me and I know for many of my readers is expensive, but a quality investment is necessary sometimes and essentials like these are a good place to start if you’re looking into buying higher end. I talked a little about the fit of these jeans in my last post but I can’t get enough of them, plus I think they look great with my new DMs from Shoetique (still available on the website in off white on sale at £79.95, or if you’re desperate for the black pair you can get them here). 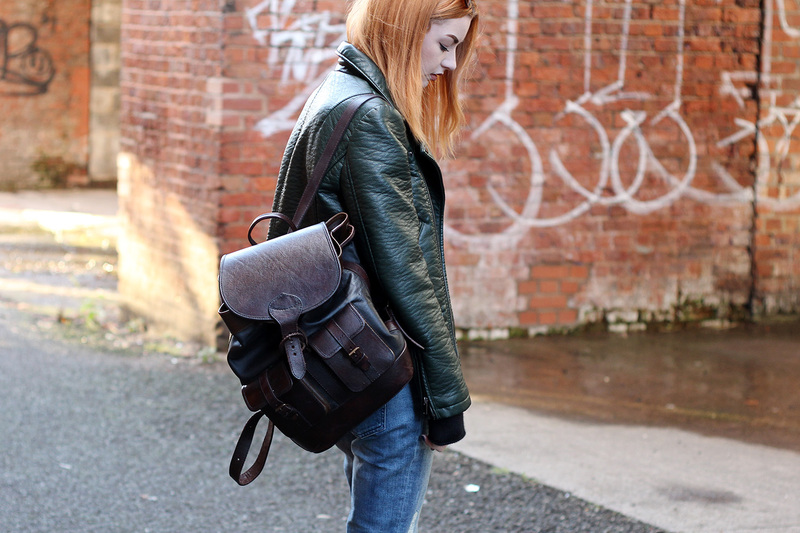 I’m also wearing a green faux leather biker which I just had to have when I spotted it in Zara for £29.99 – even though they only had size large left, I actually think it looks quite good oversized! 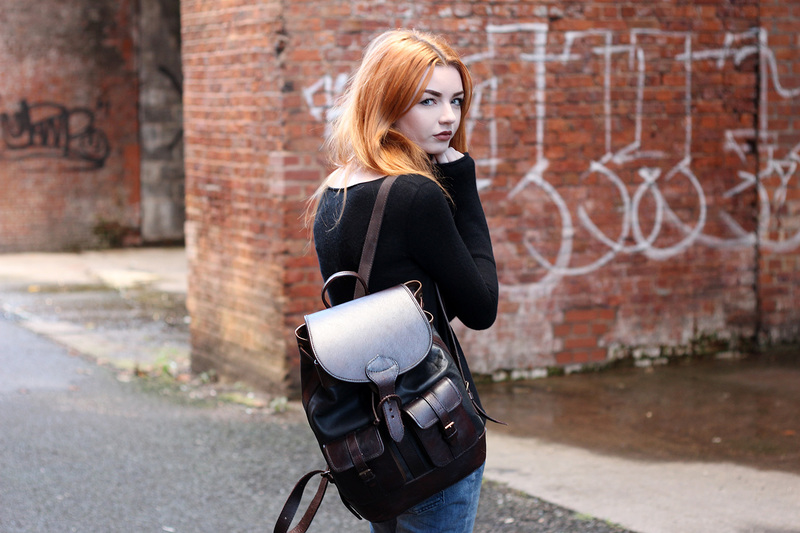 Finally, my bag is from Beara Beara and is my current fave for university. 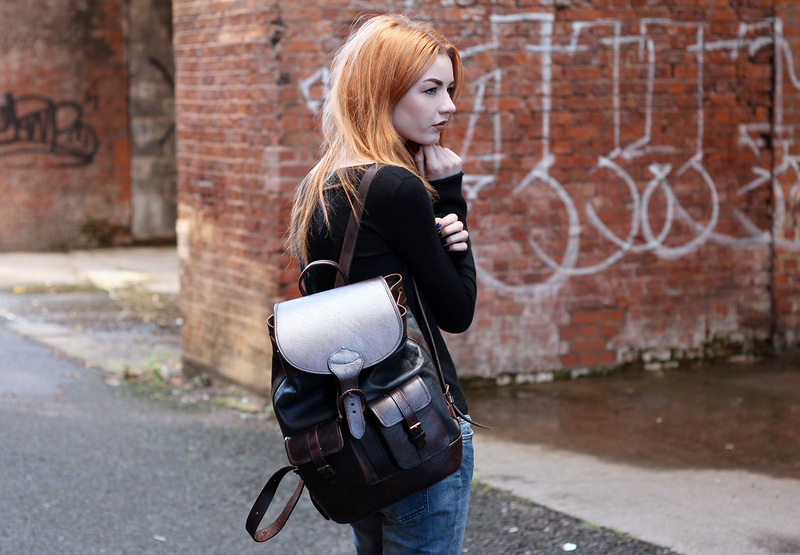 It’s (obviously) a backpack so much more suitable for carting heavy things around than a handbag is, it’s super durable so no need to replace it year after year, and it fits up to a 15″ laptop so it is plenty roomy. Plus, Beara Beara is a family run independent business so it’s win-win! Thoughts on this comfy weekend outfit? Don’t forget to enter my 7 For All Mankind giveaway to win your own pair of high end jeans! 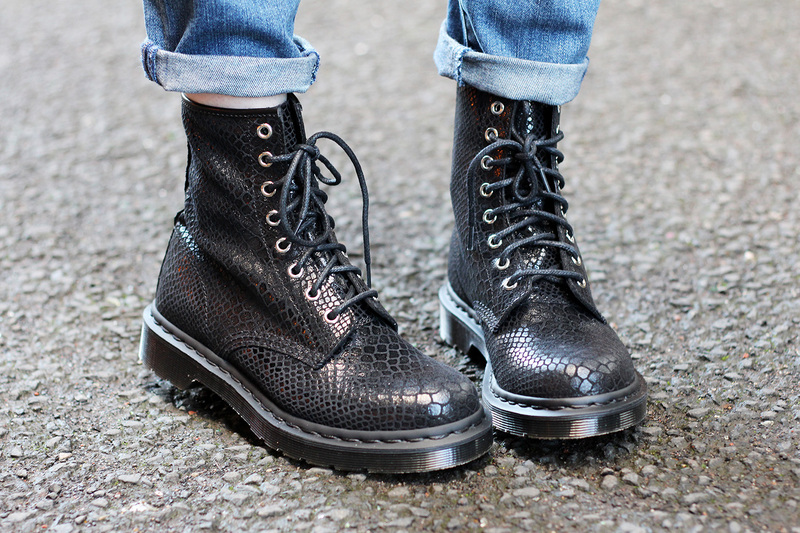 Those Dr. Martens are to die for! Love the outfit, you look gorgeous! I love this outfit ! Especially the bag ! LOVING those shoes!! Fab outfit Hannah! I love a casual outfit and this one is amazing, I love how the jacket looks being oversized also.